Today, as the Mag celebrated its 12th anniversary, an announcement was made. The introduction of RPGM Magazine Version 6.1, codename "KillerTofu", was made in the chatroom. The list of the breakdown is below. Hey guys, this is Ixzion wishing all of you a Merry Christmas! I hope hanging out with your families or just setting aside some time for yourself is going well for you. MagCon Prime 2014 has been officially announced! This is our 7th MagCon Prime (8 MagCons in total when we count MagCon West) and we couldn't be happier about it! We're a little later than usual getting this information up, but it's still all good. All the details for this convention are listed after the bump. 1/31/14 - The Mag turns 12 years old! 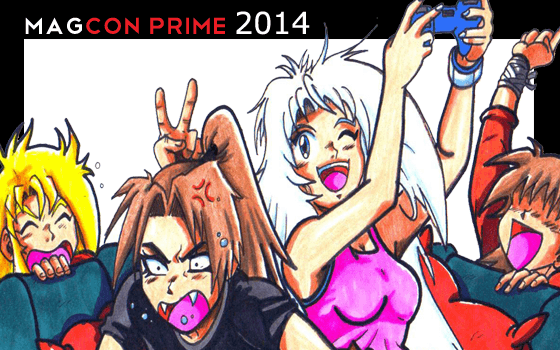 RPGM Magazine will soon have surpassed a decade in operation. Thanks to all those who have stuck through all this time and continue to be active in our community. We never would have made it this long without you! There's a chat party happening on Friday, January 31, 2014 starting at 8pm CST/9pm EST in...the chat! If you have an account, all you do it hit the chat button at the top. Welcome to the final chapter of the series designed to introduce people to the general concepts of the new RPGMM! This time, it's Imagine! If you need a step-by-step breakdown of how to use the tools, please see the Site FAQ. Welcome to the next chapter of the series designed to introduce people to the general concepts of the new RPGMM! This time, it's the RM Vault! Howdy guys. This is the second part in the series of introducing people to the overall concepts behind the new sections of the Mag. Today, we'll be covering the LP Archive!